GALION — A lot of good things have happened in the past year in Galion and Crawford County. Those positives were celebrated Tuesday morning during the Galion-Crestline Area Chamber of Commerce Economic Development Update and Business Forecast Breakfast. The annual get-together was at in the Grace Point Christian Life Center on Portland Way North. The site of the breakfast was appropriate as the Portland Way North area was a hub of new activity in the past year, and will be just as — if not more — busy this year. Gary Frankhouse, Jr., head of the Crawford County Partnership for Education and Economic Development, talked about lending opportunities for new businesses and how those opportunties can pay off in the future for Galion and this area. Arby’s and the Sleep Inn and Suites opened recently on Portland Way North, also know as Ohio 598. Longstreth Memorials is relocating from downtown Galion to a much larger across the street and in between the new fast-food restaurant and the Sleep Inn. On the drawing board for this same area — near Brandt Road and Ohio 598 and U.S. 30 — is an event and wellness center, that Frankhouse says could mean millions of dollars for Galion and the surrounding area. Frankhouse said a grant has been received and some preliminary design work has begun, a project that is still a couple of years away, if it comes to fruition at all. A Valero gas/service station and 24/Store has also staked out a spot in the area for future development. “We are taking advantage of new investments in the area to pay for the infrastructure that is needed for more development,” Frankhouse said. He said innovation and thinking “outside the box” is a necessity for future development. Sean Longstreth of Longstreth Memorial spoke about his company’s need to expand. “We’ve been in business since 1868. That’s three years after the civil war, and the same family has been in charge for five generations,” he said. And the business owners never really thought seriously about leaving Galion. “Our No. 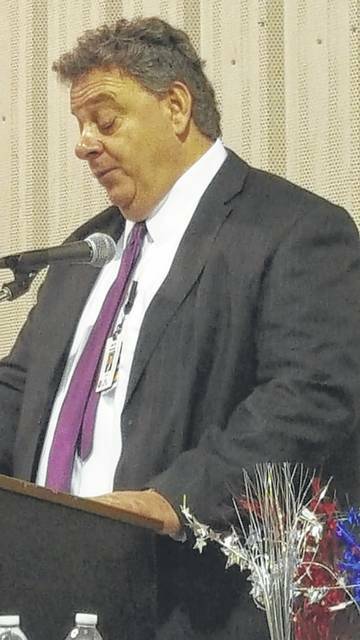 1 goal is to continue to operate in Galion,” he said. That was a theme throughout the breakfast. Making Galion a better place to live and a place people want to visit was another theme. Galion City Schools superintendent Jim Grubb; United Bank’s Don Stone; and Eric Pittman, manager of the Sleep Inn and Suites; also spoke about their desire to make Galion a getter place to live. So did Galion Mayor Tom O’Leary, who pointed to some recent success in the area, emphasizing the new splash park facility at East Park. O’Leary also discussed the team work between the county and different entities in Galion, Bucyrus and elsewhere and the success that has come from that hard work. One community member that has been active locally with their investment dollars is Avita Health System, which started out as Galion Community Hospital. Avita’s Jerry Morasko talked about the challenges associated with that company’s rapid growth in recent years, and the competition among health care providers in north central Ohio. On the heels of the Ontario Avita opening at the Richland Mall, Morasko also talked about new expansion coming to Bucyus and a distribution center coming to Crestline in the old Geyer’s building near some current Avita properties. He also repeated that a new clinic will be built in the near future in the Bellville area, just off Ohio 97 and Interstate 71. Email Russ Kent at rkent@civitasmedia.com with comments or story ideas.